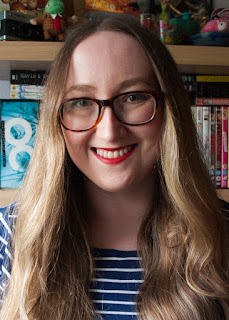 Anastasia Gammon: The Dryad of Callaire chapter reveal and giveaway! The Dryad of Callaire chapter reveal and giveaway! How exciting is this? 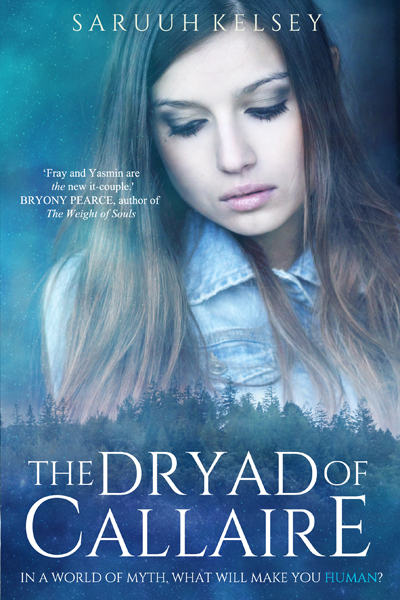 Today I have the amazing pleasure of sharing with you a chapter from Saruuh Kelsey's new YA fantasy book The Dryad of Callaire ahead of its August 18th release! And, as if that wasn't exciting enough, Saruuh is holding a giveaway for one lucky person to win a signed paperback of The Dryad of Callaire, and everyone who enters the giveaway will get a free ebook of the first book in The Legend Mirror series, The Beast of Callaire. Keep reading to find out more! The Dryad of Callaire is the second in The Legend Mirror series, a YA fantasy series following Yasmin and her Legendary friends, as they become entwined in a war between Gods. The first book, The Beast of Callaire was one of my favourite books of last year and in my opinion The Dryad of Callaire is even better. Keep reading for the chapter and giveaway information! The branches that scrape my coat are embracing but I don’t want to be in Almery Wood. Too many reminders linger in the hush, the creak of ancient trees, the scent of Earth and home. I remember walking beside Fray, her warm hand in my cold one, calm and safer than I’ve felt in the weeks since I lost her. I think of the Phoenix appearing to us, when Fray pressed her fingers into the back of my coat, reassuring my fears and restraining my beast in a single touch. In my mind I see her stepping around the shield of my body, facing the Numen head on, and it’s a struggle to keep myself together. I can’t afford to break down now. I slog through a shallow stream near Almery’s pool and down the central path, my mind on Fray’s disappearance and the battle with Discordia. It only lasted twenty minutes and felt more like a frantic scramble for survival than a fight, but that’s what we’ve been calling it—the battle. We didn’t have a plan, or real weapons, or commands from someone who knew what they were doing. All we had was fistfuls of Majick, untested Akasha swords, and reckless determination. I don’t want to think about it but there’s no way to avoid what happened. It’s brutally clear to every one of the Red that we’re at the beginning of something and the end is nowhere near. We all know the battle was bigger than us, and we’re helpless to fight it. We’re only alive because Mavers used his Creation of Life to make Majickal creatures to defend us. Even Amity must have known how doomed we were because she betrayed us for Discordia. None of us dreamed she’d let a murderous Numen past the Ward of the Academy to kill us. That was four weeks ago. It’s been four whole weeks since I lost Fray, since Priscilla Hannam was taken and nobody saw her disappear, since Discordia decimated the Red, twisted our minds, and sucked our Majick from us like a parasite. Since Discordia drained me of all my Earth Majick and made me weak. And I don’t know how to be strong again. I don’t know if I want to be strong again. Fray’s missing, it’s my fault, and I don’t know how to find her again. Minnie tried reading tarot cards for even a bare glimpse of where my girlfriend is but she couldn’t see anything. She said it was like someone expected her to look for Fray and had locked her outside Fray’s pathways. Maybe they did. When Min read for information about Discordia, her head was filled with static, like I filled Discordia’s mind with noise during the battle. That’s no coincidence; I gave Discordia the idea. Even if I didn’t, the Numina know to expect Minnie’s readings, so we can’t find answers that way. Or any other way. In the beginning, just after the battle, Mavers sent a message to the Shadow Ministry—our highest power, a council of Numina and Legendaries alike who are absolutely impartial, all-seeing, and all-powerful—asking for help both in protecting ourselves and finding Fray. They replied that it was impossible for them to intervene because of an ancient law. At that point I was passed out in the infirmary recovering from the loss of my Earth Majick, so I wasn’t involved in any decisions the Red made. But Minnie told me all of what transpired after the fight, and none of it was good. Mavers asked literally everyone he knew for help and they answered with a unanimous no. Niall was sent back to America, traumatised and with no guarantee of safety. Guy spent all his Majick on mending the scrapes and slashes on our bodies with his healing wind of Akasha. Rowan was shot in the battle by a possessed hunter, and Mavers exhausted himself by feeding all his Creation of Life Majick into Rowan’s body to restore his life—Minnie says Mavers’s Majick is only now returning, and in nothing more than a few trickles of power per day. Fearne trashed and remade the dining room over and over with her Akasha, venting her grief and fear on shattered crockery and splintered mahogany. And we were all left with a ragged void in the shape of Amity Ex Lavere. That loss lingers in every room of the Academy, haunting us. It has followed me here as well, through the twisting trails of Almery. Shaking off the ghosts of memories, I put one foot in front of the other, over and over until I reach the border of the wood where the animals go quiet and the trees hold their breath. Fray’s house sits squat and square and gold in the middle of its overgrown field. Waiting for her to come home. I press my hand to the throb in my chest as I approach the cold Ward around Fray’s house. I half expect it to reject me now the house is vacant but I step over the gravel pathway with nothing but a shiver zapping my body. The back door is torn from the hinges, propped on its side against the frame. I remember slamming into it in my desperate attempt to find Fray, when all I knew was my tether to her had broken and an alien hollowness had replaced it. I never knew my connection to her was so strong, so vital, until it was torn from me. Now all I know is an aching, empty lack. Loneliness echoes my every footstep, the only emotion that doesn’t urge me to self-destruct—because being lonesome is as familiar to me as the Change and I know how to bear it. Distracting myself from the swell of other, darker emotions—the ones that want to crush me—I drag Fray’s bubble-gum-pink door over the threshold and rest it against the outside wall. I feel bad about the damage but I blame it on my beast goading me into destruction. Thinking about the Manticore, I automatically seek the moon in the sky despite the daylight; I can’t see it but I can feel it like a string tied around my waist. Tonight’s moon is as neutral as it gets, barely pushing me, barely pulling, but my beast is confident despite that. Mavers would say I was out of control if he spoke more than a few dead words at mealtimes. My humanity is balanced on a knife’s edge and the slightest nudge could ruin me, but who can I turn to for help? I would run to Fray and her calming embrace but she’s gone. And I don’t want Guy seeing how deep my darkest depths really are. He can’t know that a growing part of me is dying to surrender to the Change, to curse anyone I might kill just for a few hours solace. I could go to Minnie or Vic or Willa but I daren’t tell them how close I am to crossing that line, how my voice of reason becomes quieter with every day I fail to find Fray. They’d see me for the monster I am. So I’m here, at her home. I’m not ready to relive my fight with Discordia but I need to see if they left anything behind, something to give me even the slightest hint at where they’ve taken Fray. The house beckons me and I step inside, inhaling the dust and flowers scent I remember. Underneath that I taste dirt from the plant pot I smashed over the Numen’s head and the faint tang of blood. I shouldn’t be able to taste that but my senses are heightened. Another bad sign. Arms wrapped around my waist, I wander the rooms of Fray’s house, slivers of my heart blackening with each one I find vacant. Fray’s house is wrecked, furniture overturned and trampled, picture frames hanging cockeyed in the hallway, turquoise vases in pieces on her living room carpet. It’s a mess, a heartless reminder of Fray’s absence. Some part of me believed this was all a mistake and Fray was still here. It didn’t matter that I’d have heard from her by now, that our minds would still be connected and my phone would be full of texts and missed calls, not to mention she’d have turned up at the Academy gates, demanding to know why she hadn’t seen me in a month. In the back of my mind I thought I’d find Fray sat cross-legged in the middle of this mess, wired on coffee, her hair twisted into a bun and secured with a pink biro, bent over a pile of research on some random subject. A scuffle echoes down the hallway, cutting through my illusion. I face the noise, a rumble of warning in the back of my throat as my ears strain to identify the occupied room. The kitchen. I return to the hall, expecting Guy to emerge—he probably followed me to make sure I was safe—but it’s not my brother. What I see instead is an unfamiliar face. In the kitchen there’s a man watching me with abyss-black eyes. I know instinctively that they’re a Numen. They’re uncommonly tall with gaunt, stretched features and a pressed suit the blue of night. Their smile is a threat and a promise, teeth too sharp for any Pure. They look like a God but they can’t be—there’s no flow and crackle of Majick in their veins. They have to be a Creature posing as a human, the way the Phoenix did. Or they have the same Majick as Discordia—theirs was nothing I’ve felt before, visible only as a green whisper of air, and I didn’t sense it before they turned it on my brother. The possibility makes my blood run cold. This stranger could be the same species as Discordia, could have the same power and relentless thirst for Legendary Majick. They could siphon my Psychic. In a heartbeat I could lose my last chance of finding Fray—my painful wish for her to call out to me the way she did in the beginning. I know our link has unravelled, and I can’t sense her the way I can sense everyone I’ve spoken to if I concentrate; I can’t hear a single whisper of her thoughts, but she could still call for me. Fray has unthinkable power. She could speak to me, I know, if she put all her power into it. But will she think to try? Fray is human. If I weren’t a Legend-Blood raised with Majick would I ever think to speak telepathically? I don’t think it would occur to me. A brush of seeking Majick raises hairs on the back of my neck, and my consciousness returns to the wreckage of a house and the menace of a man. I have no Earth to shield myself with, no way to use my Psychic Majick to defend myself. I’m easy prey to this Numen. But why are they just standing there assessing me with their Majick? For a second I don’t understand—but then I see the reason in their eyes. They’re amused, curious, waiting to see how I’ll react. What did Fray do when Discordia came for her? Did she cower? Run? Fight? The realisation slams into me and I don’t know how I missed it. Discordia was waiting for me here a month ago, and Fray was already gone. I always assumed the Numen stole her and came back to find the Red—but maybe I was wrong. Maybe Discordia didn’t take Fray. Maybe they were here for me. Maybe this stranger in the kitchen, this Numen with a playful smirk and razorblade eyes, took Fray. Fray was mine to protect and I failed her. She was vulnerable to my danger, Legendary danger—the danger standing two metres from me. The beast in my blood leaps to the surface and I let it take hold, embracing the vicious edge of myself. For Fray. Wrath clears my mind. My vision narrows to the pulse jumping in the Numen’s throat. I take a deep breath, relish the pain of my gums tearing to allow sharper fangs, and I launch my body across the hall. I sail through the air past family portraits and a whiteboard marked All coursework due Monday!!! in bright red. The Numen moves at the last moment, enough that my teeth miss their neck and sink into their shoulder. I don’t bite like a human—because I’m not human. I bite like the animal I am, and my claws shred the Numen’s expensive suit. I spit a mouthful of muscle and blood and fabric onto Fray’s kitchen tiles, and the Numen roars, pain trapped inside pure rage. I must have taken them by surprise because for a second they don’t fight me. But then their hands are bruising my shoulders, pulling out my hair, ordering me to let go. But nothing could make me stop. I’m too inhuman to consider the possibility that killing this Creature, this person, may be too far. I stab my claws into their jugular and rip an uneven line across their neck. The Numen drops to the carpet with a gurgle. This giveaway is for 1 signed paperback of The Dryad of Callaire (UK only!) and everyone who enters will get 1 free ebook of The Beast of Callaire, the first book in The Legend Mirror series. Please leave your email address and preferred ebook format for your free ebook. Ebooks will be sent out in the week following the giveaway's closing date. The winner of the signed paperback will be emailed by the 20th August and will have two days to reply before another winner is selected. Non-UK entrants are not eligible for the paperback giveaway and will not be selected. The contest ends 16th August.